Late in 2017, more than 20,000 QTU members expressed their feelings about standardised testing and robot marking, loudly and clearly, by voting in large numbers to ban the implementation of NAPLAN Online, call for a full review of the NAPLAN testing regime, reject robot marking and resist any move to implement the Turnbull government’s proposed standardised phonics test for six year olds. After a decade of NAPLAN testing, teachers, school leaders, school support staff, parents and students are speaking out about the negative and pervasive impact of the regime and expressing frustration at the refusal of the Turnbull government to genuinely engage with school communities to discuss their concerns. While NAPLAN is a testing regime implemented by the federal government, the effects are very much felt at the local level. For teachers and school leaders, the impacts of NAPLAN are well known. Many speak of the narrowing of the curriculum as some learning areas or pedagogical approaches are squeezed out due to pressure to undertake NAPLAN preparation, not just in the lead up to the test, but all year around and across all year levels. Teachers have expressed frustration at being asked to set aside the important work of planning and differentiation for their classes to mark NAPLAN practice exams. In the most extreme cases, there have been instances, which are both patronising and disrespectful, when teachers have been required to undertake the test themselves or to produce pieces of persuasive and narrative writing under the guise of better understanding the skills they need to teach. Widespread reports of schools awarding certificates or special rewards for NAPLAN results are an indication of just how much the high stakes NAPLAN testing regime has impacted negatively on the culture of schools. Beyond this, NAPLAN data as an indicator of teacher and school success, often with very little context or analysis added, is not only misused by the media and some politicians but is privileged by many school, regional and statewide processes within the Department of Education. The QTU is not opposed to online assessment programs and computer-based testing; these are used well by many schools to provide diagnostic feedback, providing valuable information on what students can do and how best to support them to improve. The QTU is also supportive of the digital technologies curriculum and resourced programs that accompany the curriculum and support the development of students’ ICT skills. However, when we believe that it is time for a complete review of the NAPLAN pen and paper testing regime, it makes no sense at all to forge ahead with the implementation of an online version. NAPLAN Online can only serve to further disadvantage students and school communities that have had inequitable access to technology at home and at school. 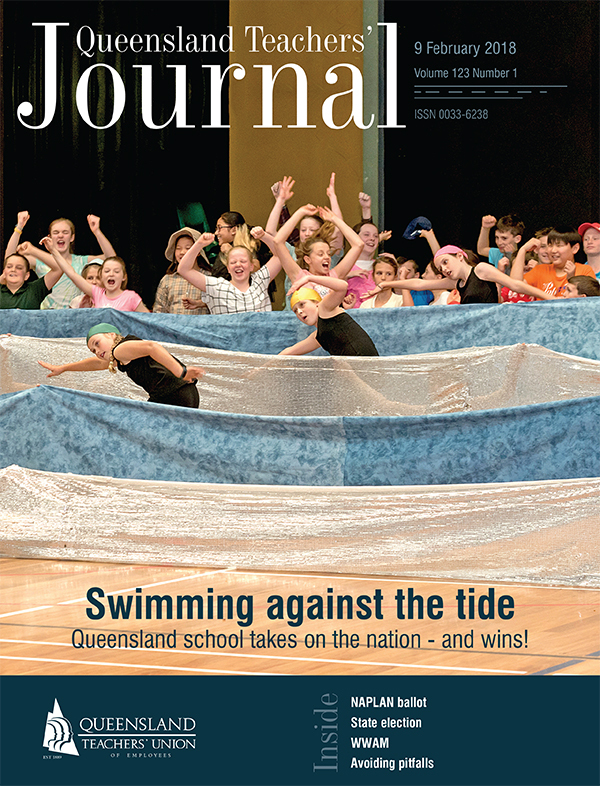 In voting to ban the implementation of NAPLAN Online in Queensland state schools in 2018, Queensland Teachers’ Union members have drawn a line in the sand. Our work cannot stop here. This year, the QTU will be asking you to tell your stories of the ways that NAPLAN testing impacts upon your students, yourself, your classroom and your school. We will join with our colleagues interstate from branches and associated bodies of our national union, the Australian Education Union, to assert our professional voices. We’ll make our collective voices heard.